JAZZ magazine Summer 1976 Vol. 1 No. 1 FIRST ISSUE! 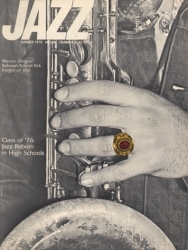 The American periodical Jazz Magazine was a short-lived publication which ran in the late 1970s and published articles and photos of the highest quality. This issue, Summer 1976, is Vol. 1, No. 1, the very first issue! In addition to a remembrance of Duke Ellington, the magazine includes articles on Rahsaan Roland Kirk, and stories by Jazz scholars Vincent Pelote and Dan Morgenstern, as well as contemporary reviews. These magazines are a tremendous resource for researchers and Jazz fans alike, not to mention a highly entertaining read!